If you’ve read either The Dot or Ish, Peter H. Reynolds’ fabulous picture books about celebrating creativity and making your own kind of art, even if you (or others) don’t consider you artistic, then you’ve already encountered the basic principle behind International Dot Day — making your mark in some artistic-ish way, and celebrating your own creativity, and the creativity of others. You can find a Perfect Picture Book review of The Dot at both Patricia Tilton’s blog and Heather Newman’s blog, and a PPB review of Ish at Joanna Marple’s blog. In The Dot, a little girl is adamant that she cannot draw — until her teacher encourages her to try. From her first simple marker-dot on a page, and the teacher’s empowering “now sign it” which validated the girl’s artistic expression in her dot, she went on to explore more and more ways to make her mark. When teacher Terry Shay read The Dot, he decided to have his classroom celebrate their own creativity by creating their own dots — and the idea has expanded over the past nine years into International Dot Day, a worldwide celebration. This year there are over one million participants in 64 countries! Every year around September 15th (September 15th-ish, to use the terminology of Peter’s Ish book) people create dots, either simple or elaborate, whatever their imagination wants. You can see examples in the Gallery of the Dot Club. There is also a site where authors and illustrators post their dots — Celebri-dots. You’ll see all kinds of creativity there! It’s not too late to join them — check out the information at the website of The Dot Club. And for those of us who are bloggers, Patricia Tilton of the wonderful blog Children’s Books Heal suggests that we create dots and post them on our blogs — see her post here. Drawing a maze is a fun challenge! 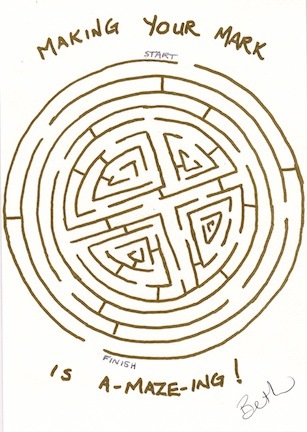 I encourage you to print this out and solve the maze — it really works! 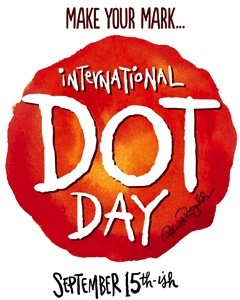 Are you participating in Dot Day? Let me know in the comments! LOVE this, Beth! So clever! I so enjoy seeing everyone’s dots. I didn’t make one this year, but it’s so fun to see how creative everyone else is! Now I need access to a printer! What a great idea, Beth! Very creative and clever idea. I followed it with my mouse and got stopped several times. Getting out was harder. And, thank you so much for the mentions. I didn’t expect the mention at all.